On the occasion of this year’s Mission Week, we are beginning the campaign, Surround the Missionaries with Prayer! This is a form of spiritual adoption of Franciscan missionaries from our Province. To participate in this campaign, just write us an email or letter with a declaration of your desire to pray for a missionary. We will send a prayer card to interested people. The prayer (in Polish) is for daily recitation. On the back of the card you will find the name and location of the missionary for whom you will pray. 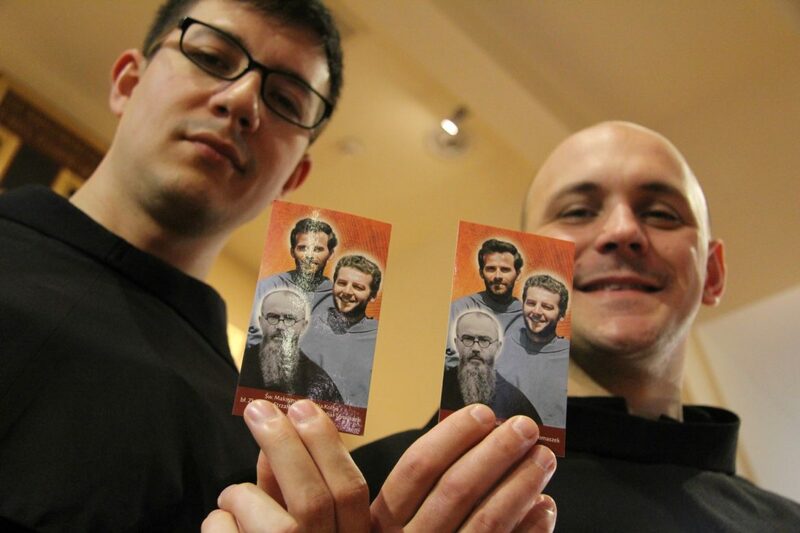 The basic daily prayer for memorization is offered through the intercession of the blessed martyrs of Pariacoto and Saint Maximilian Kolbe – Franciscan missionaries pictured on the card – but there is nothing to prevent you from praying other prayers in spiritual support of your adopted missionary. All who are interested can send an email to misje@franciszkanie.pl. In the subject line, copy and paste the words ‘Otocz modlitwą misjonarza’ (i.e., ‘Surround the missionaries with prayer’). Your message should express your wish to pray for Franciscans working in the missions. To receive a prayer card (in Polish) with the name of a missionary, include your postal address. Copy and paste or write ‘Otocz modlitwą misjonarza’ in your note. The Cracow Franciscan Province has missions in South America in Bolivia, Peru and Paraguay; in Asia in Uzbekistan; in Africa in Uganda and in Ukraine in Europe. Besides pastoral work, proclaiming the Word of God and administering the sacraments in distant countries, missionaries undertake social projects to improve the quality of life of the people in missionary countries.